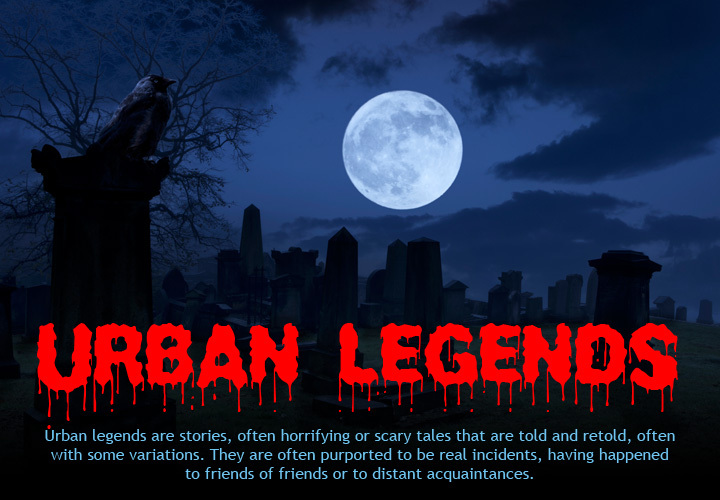 Urban legends are stories, often horrifying or scary tales that are told and retold, often with some variations. 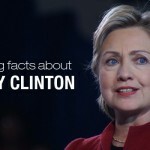 They are often purported to be real incidents, having happened to friends of friends or to distant acquaintances. 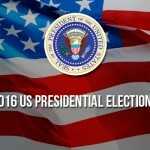 In the days of the Internet these urban legends are written about in many boards and circulated as e-mails, often with superstitious warnings. 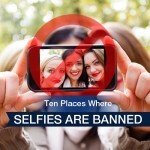 Here are 10 very popular urban legends from different parts of the world. 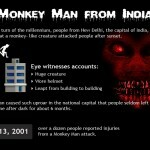 Around the turn of the millennium, people from New Delhi, the capital of India, started to claim that a monkey-like creature started to attack people after sunset. Eye witnesses said that though huge, the creature had all the characteristics of a monkey but wore a helmet and got away by leaping from building to building. Monkey man caused such uproar in the national capital that people seldom left their homes alone after dark for about 6 months. 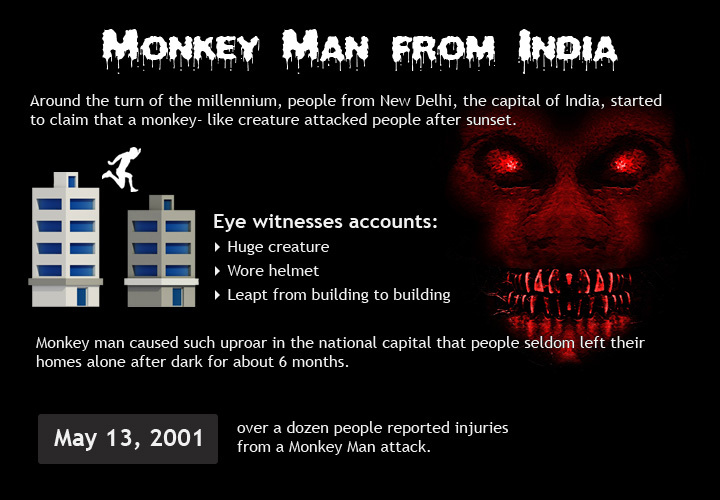 On May 13, 2001, over a dozen people reported injuries from a Monkey Man attack. Some were scratched and bitten while others sported bruises. 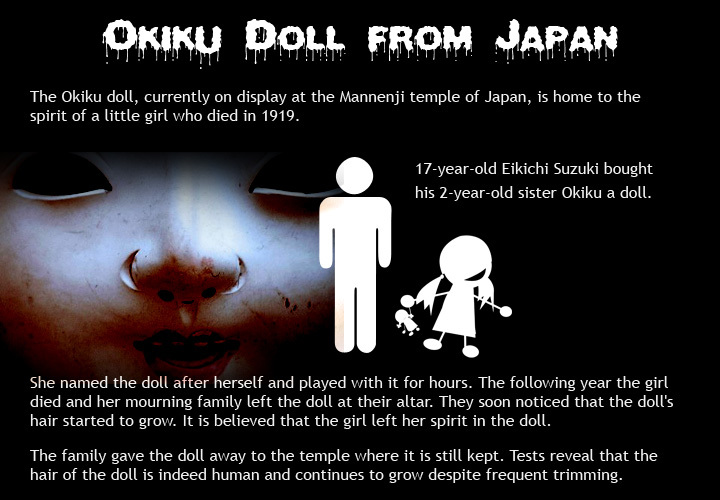 The Okiku doll, currently on display at the Mannenji temple of Japan, is home to the spirit of a little girl who died in 1919, or so the urban legend goes. In 1918, when 17-year-old Eikichi Suzuki bought his 2-year-old sister Okiku a doll, she seemed to be really taken in with it. She named the doll after herself and played with it for hours. The following year the girl died and her mourning family left the doll at their altar. They soon noticed that the doll’s hair started to grow. It is believed that the girl left her spirit in the doll. The family gave the doll away to the temple where it is still kept. Tests reveal that the hair of the doll is indeed human and continues to grow despite frequent trimming. This urban legend from Ireland is the story of a very beautiful young woman called Eliza Day who fell in love with a stranger. Growing up, Eliza’s extraordinary beauty earned her the nickname The Wild Rose due to the abundance of wild red roses growing in the vicinity. A stranger came to town and was immediately attracted to her beauty and simplicity. He called on her and took a single wild rose with him. Eliza too fell in love immediately and agreed to meet him the next day by the river. 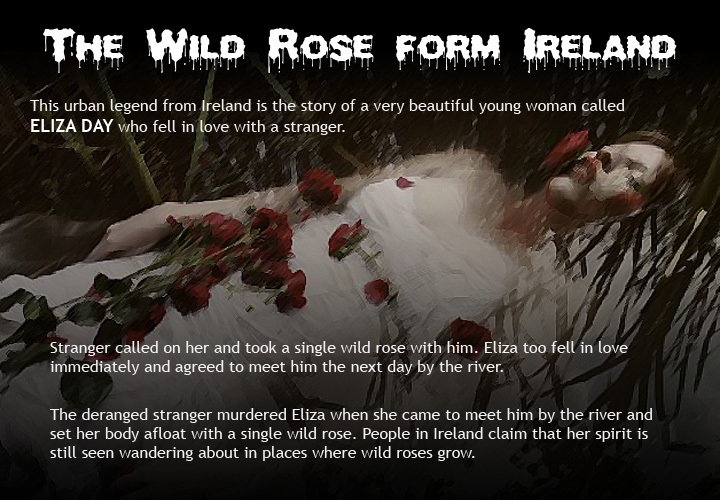 The deranged stranger murdered Eliza when she came to meet him by the river and set her body afloat with a single wild rose. 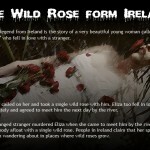 People in Ireland claim that her spirit is still seen wandering about in places where wild roses grow. 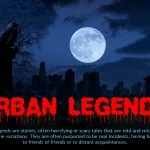 This urban legend has many variations as far as the specifics go. But the general story is quite the same. 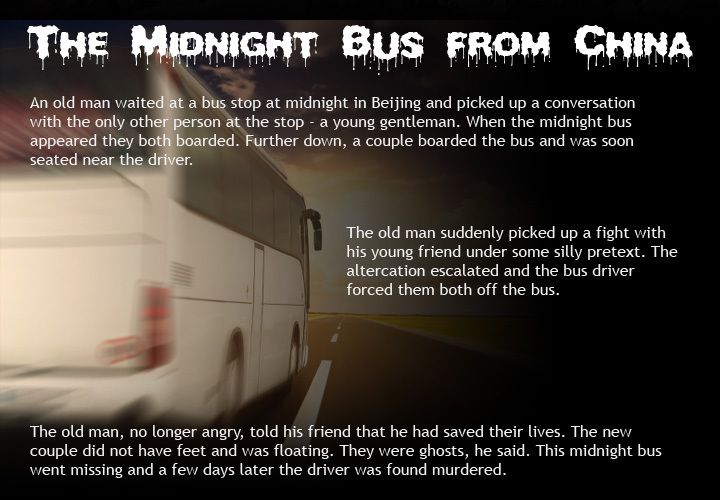 An old man waited at a bus stop at midnight in Beijing and picked up a conversation with the only other person at the stop – a young gentleman. When the midnight bus appeared they both boarded. 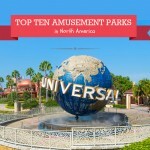 Further down, a couple boarded the bus and was soon seated near the driver. The old man suddenly picked up a fight with his young friend under some silly pretext. The altercation escalated and the bus driver forced them both off the bus. The old man, no longer angry, told his friend that he had saved their lives. The new couple did not have feet and was floating. They were ghosts, he said. 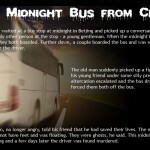 This midnight bus went missing and a few days later the driver was found murdered. 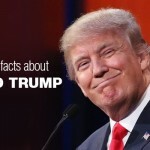 Like most urban legends this one has numerous variations and has been often retold as something that happened to “friends of friends of friends”. The story is about an American couple on vacation in Mexico. 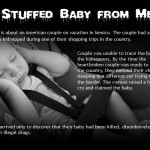 The couple had a baby which was kidnapped during one of their shopping trips in the country. Despite following up frantically with the police the couple was unable to trace the baby or the kidnappers. By the time the heartbroken couple was ready to leave the country, they noticed their child sleeping in a different car trying to cross the border. The woman raised a hue and cry and claimed the baby. 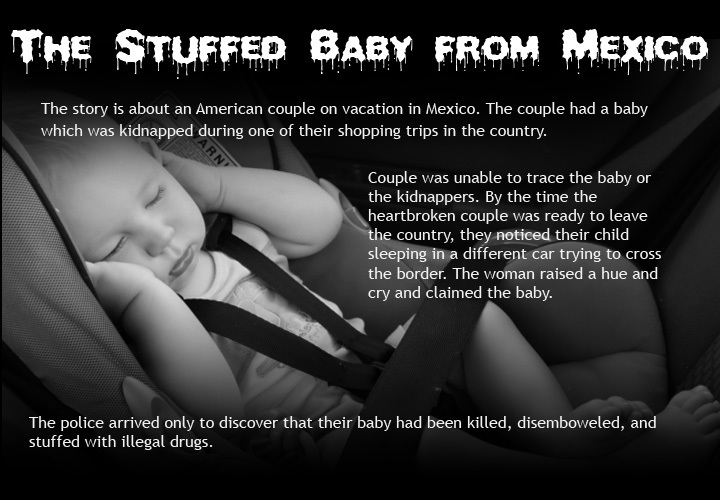 The police arrived only to discover that their baby had been killed, disemboweled, and stuffed with illegal drugs. 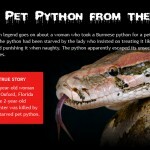 This urban legend goes on about a woman who took a Burmese python for a pet. 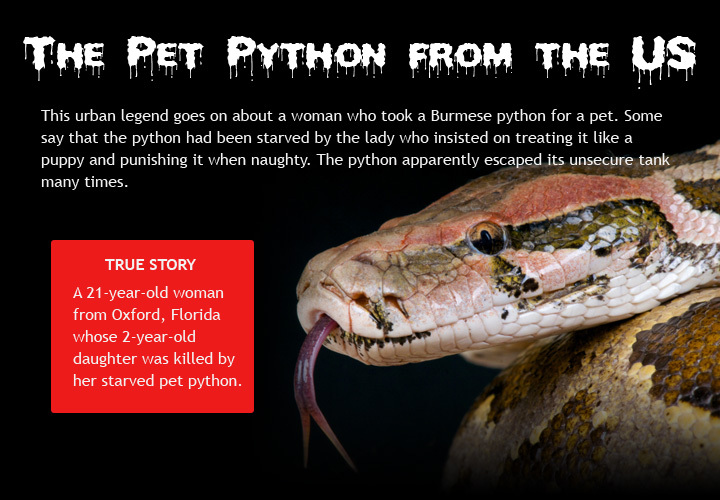 Some say that the python stopped eating for many days in preparation for a long meal while other versions of the story say that the python had been starved by the lady who insisted on treating it like a puppy and punishing it when naughty. The python apparently escaped its unsecure tank many times. It ended up strangling (and in some stories swallowing) the lady’s 2-year-old infant child. If that is not scary enough, consider this. This is the true story of a 21-year-old woman from Oxford, Florida, whose 2-year-old daughter was killed by her starved pet python. 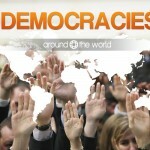 Belief in the afterlife and in rebirth is quite common in many cultures in the world. 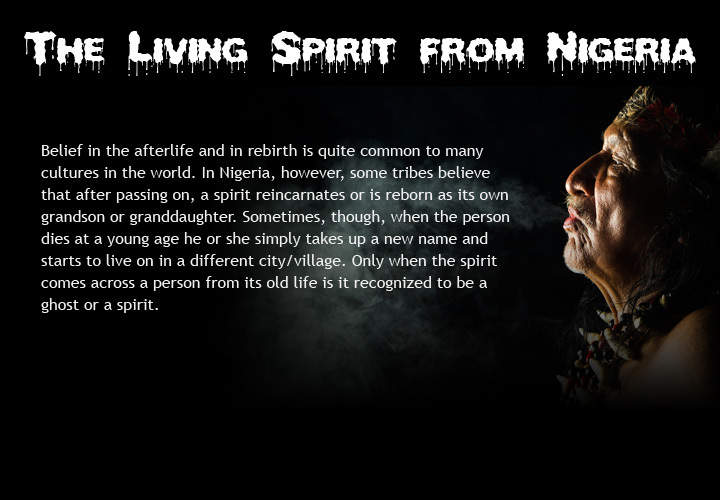 In Nigeria, however, some tribes believe that after passing on, a spirit reincarnates or is reborn as its own grandson or granddaughter. Sometimes, though, when the person dies at a young age he or she simply takes up a new name and starts to live on in a different city/village. Only when the spirit comes across a person from its old life is it recognized to be a ghost or a spirit. 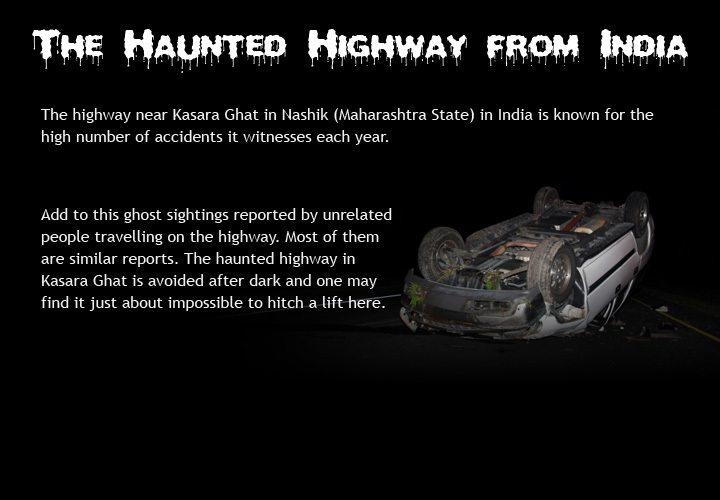 The highway near Kasara Ghat in Nashik (Maharashtra State) in India is known for the high number of accidents it witnesses each year. 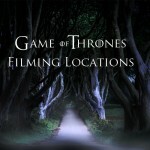 This alone is enough to spark stories of paranormal activities. 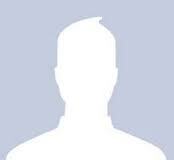 Add to this ghost sightings reported by unrelated people traveling on the highway. Most of them are reported to be similar. 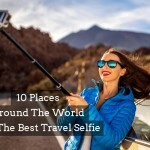 The haunted highway in Kasara Ghat is avoided after dark and one may find it just about impossible to hitch a lift here. 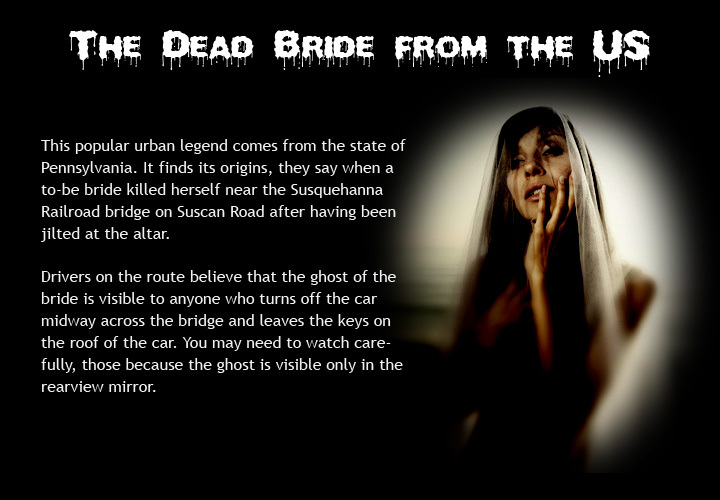 This popular urban legend comes from the state of Pennsylvania. It finds its origins, they say, when a to-be bride killed herself near the Susquehanna Railroad bridge on Suscon Road after having been jilted at the altar. 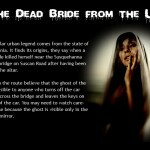 Drivers on the route believe that the ghost of the bride is visible to anyone who turns off the car midway across the bridge and leaves the keys on the roof of the car. You may need to watch carefully, because the ghost is visible only in the rearview mirror. 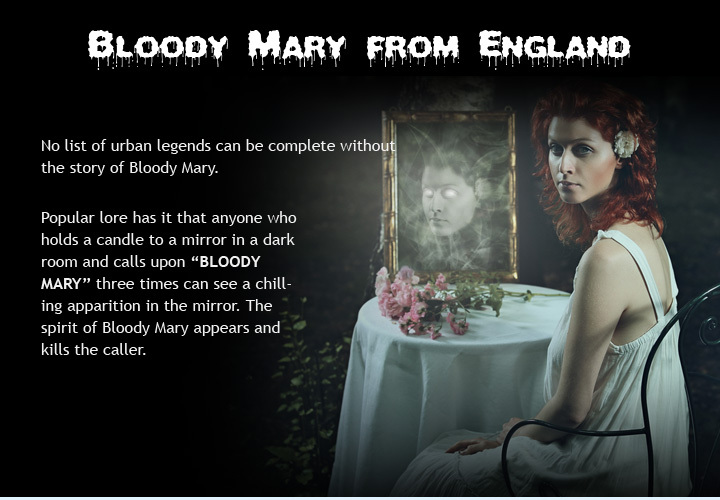 No list of urban legends can be complete without the story of Bloody Mary. This one has the most variations. 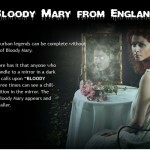 Popular lore has it that anyone who holds a candle to a mirror in a dark room and calls upon “Bloody Mary” three times can see a chilling apparition in the mirror. The spirit of Bloody Mary appears and kills the caller. Some believe that this oft repeated urban legend is a reference to Queen Mary I who as queen was under great pressure to produce an heir but could not due to numerous miscarriages. She was succeeded by Queen Elizabeth after many disappointing pregnancies that took a toll on her health.